Karen Salyer McElmurrays newest novel is The Motel of the Stars (2008 Sarabande Books). The novel has been nominated for The Weatherford Prize in Fiction, was a Lit Life Novel of the Year and was named Editors Pick by Oxford American. 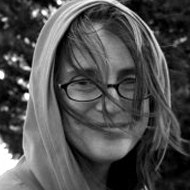 She is also the author of Surrendered Child: A Birth Mothers Journey, recipient of the AWP Award for Creative Nonfiction, as well as Strange Birds in the Tree of Heaven, winner of the Chaffin Award for Appalachian Writing. Associate Professor in Creative Writing at Georgia College and State University, McElmurray is Creative Nonfiction Editor for Arts and Letters: A Journal of Contemporary Culture. I remember most my mother's hands, a warm cloth scrubbing my cheeks and her palms, smelling like citrus. As she soaped my ears and neck and underarms, she'd tell me stories from her childhood, ones about the outhouse down the hill and the way she had to wash her own face in the kitchen in a tin basin filled with sulphur water from a well. How lucky I was, she said. I wanted to be lucky, to lock myself alone in the bathroom, to lie down on the linoleum and stare forever into the bright coils of the heater she switched on every evening. Alone, I could admire the things in the cabinet that made her beautiful. Lotions and powders and orange sticks to whiten her nails. Once I rinsed my mouth with her cologne and swallowed a soapy taste that left me spinning, my first taste of liquor. I was almost never alone and I was ashamed of that. Ashamed of my own blunt fingers, their nibbled off cuticles and the way my little fingers were as crooked as hers. The one half-gone fingernail on her right hand. I was ashamed of the way her hands knew my body's secrets, the skin that never felt like my own. Twenty years after those evening rituals I will begin to write stories. Stories about young women with names like Leah or Ruth or Claire de Lune. Ones about mothers so beautiful they were clean, white dreams. The hands that write these stories are clever. They type sixty five words a minute. They neaten the edges of the torn off printer paper. They have learned to tighten the paragraph, the line, the end of the scene. But sometimes my hands do nothing at all. I sit in front of the blank screen, the empty page and I stare at these hands. I trace the star shaped scar near my right thumb. I measure the jagged lifeline that a palm reader once looked at aghast. My hands, a writing mentor once told me, have known hard work. I think about sifting soil into one hundred green plastic pots. I think about shoveling a pile of clay and peat moss and chemicals into a machine taller than myself, then bagging up the dirt for sale in a greenhouse where I made money so that, at night, I could write stories about women who are not myself. I do not write these stories. I drum my fingers on the desk. I get up, head outside to the garden, the watering hose, the car to be washed. The truth is my mother's hands weren't beautiful at all. The truth is, my mother's chapped hands must have stung with every sink of soapy water. I remember the puffy edges of the cracks that lined her palms. Her hands that bled at night so that she loaded them with Husker's and went to bed wearing gloves to soak the lotion in. How white her knuckles grew as she gripped the unclean plate, the vacuum cleaner hose, the spray bottle of bleach. Look at them, she'd say as she held out her wounded hands. Look at what I do for you. There were stories in my mother's palms that she could not tell. The stories I write, my father says, are not really true. We were, he tells me, a happy family, happy as Sunday afternoons, as happy as anyone else. For a long while, I am sad, unbearably sad, because I want to believe he is right. Above his mother's dining room table there is a print of that man with his large hands clasped in prayer and a loaf of crusty bread, for which he is grateful. White light shines down and I know in my heart this is God. But I do not write about light. I write about how, on Sunday afternoons, my father and I escape to his office, where we make secret little meals in Styrofoam cups. I write about how, each afternoon when I was a child, I was locked in the garage until almost supper time. I sat on a lawn chair and played my clarinet, its scales and riffs. I watched spit trail down onto the concrete floor. Inside the house, my mother spent hours washing her face and teasing her hair and never knew how, sometimes, I picked the lock to my own home. I tiptoed across the kitchen floor and ransacked the refrigerator, left traces of my fingers in a smooth tub of margarine. My fingers had the taste of lies. My hands conjure wounds. Friends tell me this. They say, make the story lighter. So I pull at the glittery threads beneath a quilt made of black squares. I write stories in which mother loves daughter and daughter loves herself. Is this the truth, after all? I want to remember afternoons where sunlight drifted across the polished floors. Want to remember hands stroking my hair, telling me the world was good. But eventually, I come back to it. The way voices still collide in the shadows of my past. If I use this word, I tell myself, that word. If I describe it just so. That look on my mother's face. Darkness pulses in these things I call words. Does the wound inform the truth, does the truth alter in the telling? If I reach for her hands across time and space, pry open her clinched fists, will I find love at last? Forty years after those evenings in the bathroom with my mother, I visit her in her house in Eastern Kentucky. House of her parents. House of childhood. House, now, where she has lived alone for years. On these visits, she takes out photographs and letters and cards, all of which she keeps in a leather purse my father gave her years ago. That old thing, she says about this purse. Made in a prison and he bought it for me like it was some prize. As if. She holds the purse and snaps it open, pulls out piece after piece of evidence about her life. About mine. This here, she says. It's a photograph of herself with my father when they are no more than twenty years old. His arm is draped loosely around her shoulders and she is looking at him with a mixture of reluctance and awe. And this. Another photo of herself, with me. I'm three or four years old and there's a sidewalk and snow. Her legs, I think, must be so cold with their pedal pushers, feet in those thin shoes. She is holding me by the hand and I'm looking up into white, sunlit air, air so cold and clean it makes me gasp to remember it. If only, I think as I watch her fumble in the prison-purse for one more picture or a postcard from before the war, before she married my father. If only I could stop with that one photograph of snow. Could reach through the white, white air, air so bright everything vanishes, is made new again. Then would I know the truth? Let me see, she says, as she holds up one more photograph to the light from an end table in the dark corner of her living room. The truth is my mother's hands are wounded. Today, the crooked little fingers join the curve of other digits, the stiffness of her finger bones and wrists. The past she could point to is vanishing into dementia, into forgetting altogether. At night when I visit her, I sleep in the room next to hers. I hear her turn and sigh, sigh in her sleep, then fall silent and I worry, in those silent moments, whether she is breathing at all. For over thirty years, she has lived alone, lived without touch, without any other hand to hold than her own. If she could lift her achy hands, gesture toward a moment that made her life what it is, what would that be? In photographs I own, her father stands next to her, her sisters, her mother. They are entering a church house, a service or some gathering I will never know. Her sister, Ruby, is crossing her arms and she is scowling at the picture-taker. Her mother is looking intently at the floor. Her father? His face is cast in shadows, as if he holds a secret power no one will ever question. Is this, I think, the moment that set time going? That made my mother, made me, who I am? A decade ago, I finished a novel. At the end of the book, a women dives down into the black waters of a pond, holds on to stones and branches to keep her weighted. Eventually she chooses to live, rises to the water's surface. At the time this was as close to the truth as I could get. Since then, by writing memoir, I also have risen from the dark waters. Have caught hold of what hurts, held it in my own two hands. I have translated the wound into words that bend and drift, true and inexact. I reach inside, feel the pulse of my own heart.